Mid90s is the directorial debut from Jonah Hill that looks like a documentary shot on Super 16mm that follows a young kid in Los Angeles during the mid 1990s. The kid doesn't have a happy home-life, but makes friends with the local skateboarding group that while they look harsh and talk like sailor fresh off the boat, all have an unspoken friendship for each other and look out for one another while making their way through life in these crucial years. The 1080p HD video looks good with some older stylistic choices in play along with a good DTS-HD 5.1 mix and score from Trent Reznor. The bonus features are sparse and dry though. That all being said, Jonah Hill has something to say as a filmmaker and this first film is Recommended. When you think of Jonah Hill, you might go to a Judd Apatow place like Superbad, or perhaps The Wolf of Wall Street, where Hill might be garnering laughs from his off-the-wall teeth and dialogue. But Hill is an actor of many talents as we've seen over the years and now he steps behind the camera to direct his first feature film called Mid90s, which looks and feels like a home video documentary about a group of kids in the mid-1990s. Those few years some two decades ago will bring up some nostalgic and fun memories for a lot of us with grunge music, skateboarding, and hanging out with friends. The movie follows a young kid named Stevie (Sunny Suljic), who lives with his single mom and older brother, Ian (Lucas Hedges), in Los Angeles. Not everything is sunshine and puppy dogs in Stevie's world, though, as his older brother isn't exactly kind to him and his mother is never really there for the important stuff. Stevie befriends a group of skateboarding kids in the neighborhood, who at first glance would scare the hell out of you, but deep down, through all the expletives and rough edges, this new group Stevie joins look out for each other in their own way. They even have hilarious names they go by, including Fourth Grade and Fuckshit. While Stevie believes his home-life is no good, he slowly realizes that his new friends have it way worse and, through the film, we slowly learn what the issues these young kids are facing as they work with each other to help make their lives a little better. Hill and his collaborators show the subtle nuances of each character while exploring the universality of finding a group of friends who will have your back no matter what. It's also refreshing to see a movie that doesn't hit you over the head with a ton of deep emotions and big swells in music, but rather focuses on things as small as a piece of teen angst. Despite feeling fresh, I do wish the filmmakers had included fully story arcs for more of the characters. Still, Hill navigates the narrative with plenty of heart to gain these character's trust and emotions. Lucas Hedges, of course, turns in a great performance, like he always does, but newcomer Sunny Suljic just shines brightly in this film and has a very promising career ahead of him. 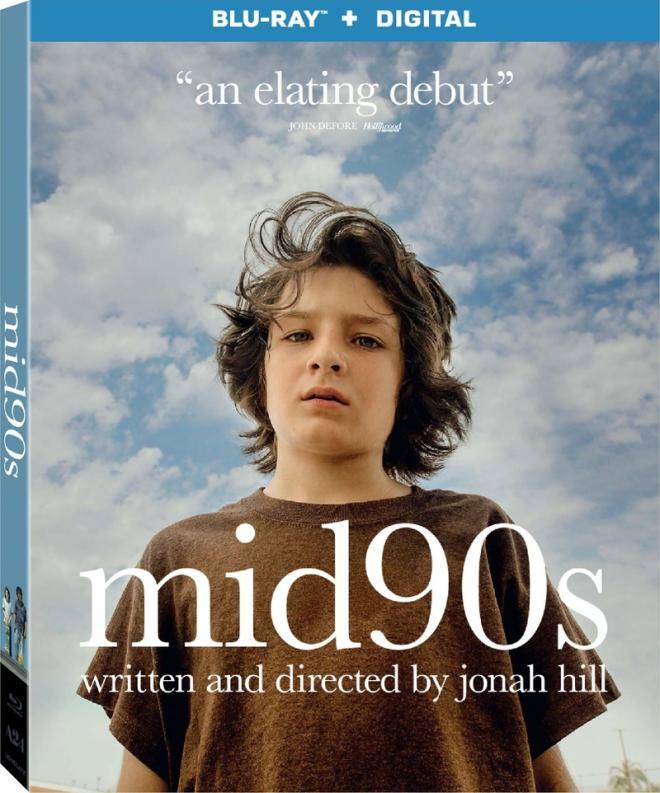 Mid90s comes with a 25GB Blu-ray Disc and a Digital Copy of the film from Lionsgate Films. The disc is housed in a hard, blue plastic case with an insert for the download code. There are a few trailers on the disc of other movies from Lionsgate. Mid90s comes to Blu-ray with a 1080p HD transfer and is presented in 1.33:1 aspect ratio with black window-boxing bars on the left and right sides of your television. Set in an era where there weren't widescreen TVs yet, the 1.33:1 aspect ratio delivers a dose of nostalgia. Stylistically, the film still has an older look to it, like it was made over twenty years ago, in addition to being shot in Super 16mm. With these facts, you can expect a very filmic presentation without any of the gloss settled over the image. A lot of the film takes place in sunny Los Angeles, however, due to the stylistic choices, some of the color palettes in the exteriors can be washed out and look a bit hazy. These sunny outdoor scenes a bigger yellow hue to it, but again, I believe this to be a style choice and not a transfer issue. When indoors though, the image becomes much cooler with blues and greens standing out more. Detail is sharp, for the most part, but can have a somewhat flat look to it along with its filmic image. There are quite a few close-ups throughout and the elements of the actors' faces appear in vivid detail, such as acne, facial hair, wrinkles, and more. Black levels are deep, even in lower lit scenes and the skin tones appear natural. Lastly, there were no problems with banding, aliasing, or film debris. Mid90s comes with a front-heavy lossless DTS-HD MA 5.1 track which rarely utilizes every available speaker with the exception of a few moments. There are some ambient sound effects of the city, vehicles driving by and skateboards rolling down the street, along with people talking in the background that sound full in the surrounds. But, as I said, this is pretty front-heavy. The biggest audio impact comes from Trent Reznor and Atticus Ross' music score, which sounds excellent and exudes the 1990s perfectly. The dialogue is clear and easy to follow along with and has can still be heard just fine over the bigger music scenes in the film. There is a subdued low end throughout, however the bass kicks into gear during the scenes where all the friends are hanging out. There were no pops, cracks, hiss, or shrills here either. Not a whole lot here really. Jonah Hill is rather dry and not the expected funny man here in this commentary and the deleted scenes are not particularly memorable either. Audio Commentary - Jonah Hill and Director of Photography Christopher Blauvelt discuss the movie here with their shared experiences making the film. They talk about shooting on location, behind the scenes, inspirations, and more. Deleted Scenes (HD, 3 Mins.) - There are a couple of short scenes here that were left on the cutting room floor, none of which add to the overall enjoyment of the film. Mid90s is a solid first feature film for Jonah Hill. He's come a long way since Accepted and it shows. There are a few issues with the film in that some characters aren't given a full story to follow along with, in addition to a flat climax. Still, Jonah manages to make us care about these characters in a deep way and makes us feel like we are watching a homemade documentary from the 1990s with some pretty impressive camera work. The video and audio presentations are both good, but nothing to write home about and the bonus features are dry and don't add much to the overall production. All that being said, this one still comes Recommended for its story and characters.